Video content marketing is on the rise and its value demands focused attention of entrepreneurs. YouTube has now become the second largest search engine globally. And with that online video marketing has become the future of content marketing. 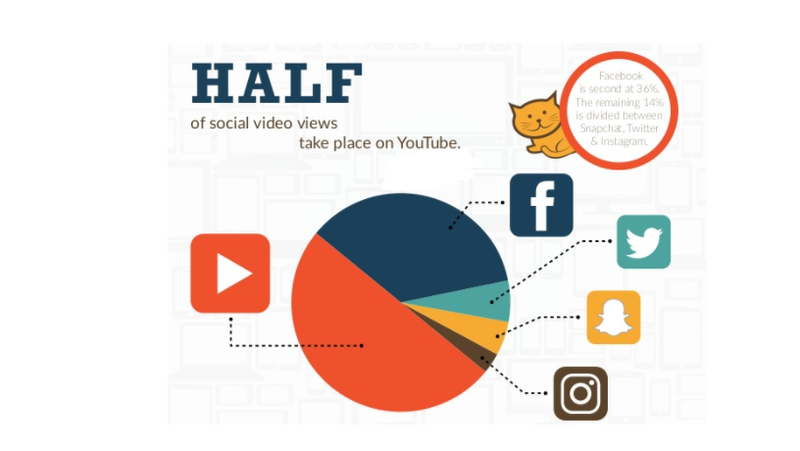 Today, videos are everywhere – YouTube, SnapChat, Facebook Live, Instagram stories, etc. Videos are believed to be an effective medium to reach the target audience. At the same time, it provides convenience and efficient way for consumers to interact with brands and increase their awareness. The trend of videos based on content marketing is progressing rapidly. As per Diode Digital, online videos are 600% more effective marketing tool than conventional forms like print and direct mails combined. With the digital penetration of smartphones and access to cheaper internet data plans, people have started consuming video content more than ever. Video marketing has become one of the fastest growing and most in-demand forms of marketing which are being used by all marketers. The following are the benefits of marketers taking advantage of video content marketing as a part of their strategy. Embedding video to a website’s content can improve the chance of a company’s website to be on the front page of Google by 53 times. Videos allow companies to increase the time spent by visitors on their websites. By writing interesting video descriptions, titles and linking them to company’s products or services optimizes videos on YouTube for SEO. Adding videos to the site can improve the click through rates leading to an increase in the conversion rates. According to a survey by HubSpot, 80% of viewers remember a video they watched last month. Since videos are highly visual, dramatic and auditory, it is easier for users to remember it as compared to text based content. While remembering the video content, the customers also remember the brand which translates into more sales. Customers usually like to share the videos they enjoy which lead to the virality of the content and expand the online reach. Videos consume a viewer’s attention more than any other medium. Capturing a customer’s attention is the key in today’s content cluttered market. In such situations, visual content offers a higher engagement where the audience is 10 times more likely to comment, share and like the content than blogs, or other social media posts. Video based content marketing becomes an effective marketing strategy that wins more followers than other forms of marketing. Responsive design across screen sizes is the biggest trend that is driving digital marketing currently. With seamless synergies across mediums, a business stands to gain traffic and higher conversion rate. This expands the reach of the content and makes it consumer friendly and focused. There is an increasing rise in the accessibility of such content with Facebook’s auto-play and Whatsapp or Instagram’s story features. Video has features like feedback loop built in. It lets you measure click-through rate, drop-off point, or the number of times it has been downloaded on watched. With access to such information, marketers can make necessary video content strategies. Video based content marketing allows marketers to know what works with the customers swiftly as compared to traditional forms. Over 65% of customers watch more than 3/4th of a video which is more as compared to text based content marketing strategy. Video content allows better retention and has higher share rate as compared to any other form. According to HubSpot, 92% of people who consume mobile video share them with other people in their network. Due to this video content marketing strategy for business becomes powerful for any company that wants to expand its reach online and attract a wider audience. Whether a company is trying to introduce their concept or service or coach prospective customers on steps to use the product, video marketing becomes a useful tool for them. Creating corporate videos or explainer videos has proved to be a successful strategy for various business organizations and animations can bring concepts to life, unlike text based content. Videos also become a perfect blend of entertainment, nostalgia and simplicity. 8. Video marketing provides a better ROI. 76% businesses claim that video content marketing provides a better ROI. At the same time, it offers a better return on customer’s value and pays off big time. With the cost of video content creation reducing consistently. With the advent of various online video creation tools, it is affordable to create video content. Startups and SMEs have also started using smartphones to create and launch simple yet powerful video content. Video based content marketing has become a valuable approach for marketers. Moreover, it stands out unique and it has a positive impact on your customers. Your customers wants to feel good about their choices, and video content marketing assists them in providing this feeling. Why 72% Of The Companies Outsource Their Social Media Marketing? Corporate animation videos help you express your big ideas, draw attention and build compassion.